Corporate gifts, Weddings and Special events. Why not show your appreciation and say thank you, wish your valued clients a Merry Christmas,or even say "happy Monday" by sending them a personalised gift of Gower Cottage Brownies? We can add your company logo on a unique sleeve and reflect your corporate colours in a bespoke gift to mark any occassion. Our printing partner can help you with your artwork, preparing proofs and guarantee you a high quality professional finish to complement your gift of Brownies. Your Brownies will then be wrapped in your corporate sleeve, and shipped using our next day courier service that is guaranteed to delight your customers. Prices for printed sleeves start at £57 +vat for 50 sleeves. than any of our previous corporate gifts..."
"C2 Recruitment would like to say a big thank you to Kate and her team for the fantastic brownies you supplied. As a national recruitment consultancy we work with some of the UK’s leading brands and I have to say the feedback from our clients has been exceptional. Our clients not only told us that they tasted delicious but also commented on how professional the packaging looked. 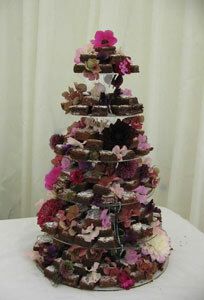 Overall very happy with the product and we will definitely continue to use Gower Brownies again." 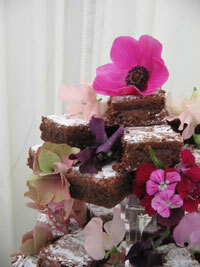 For your special day why not serve your favourite Gower Cottage Brownies either as a dessert or instead of a more traditional wedding cake. For Parties, anniversaries or any special event we are happy to supply wholesale trays of brownies which you can portion and serve to suit your purpose. For a wholesale price, including delivery anywhere in the UK please Contact Us. 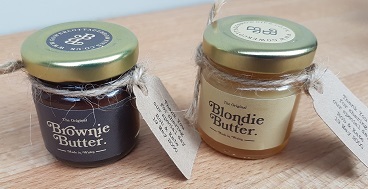 How about our his'n'hers wedding favours in mini(1.5oz) jars as a special chocolatey treat on your special day.